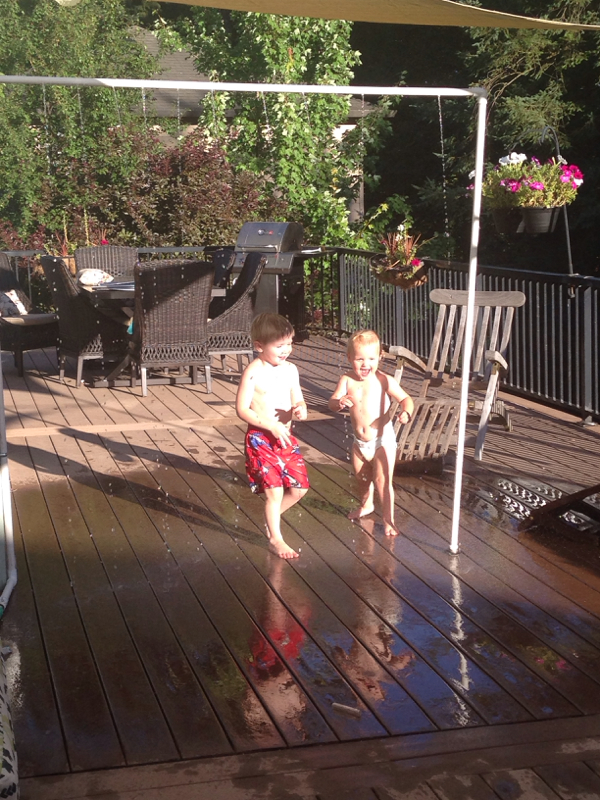 This is the fun beginning to our entire deck being rigged with water play stations. I plan to build a retaining waterfall just below so that the whole system is recycled. I own my home and love building on it as I want. I also love having no plans to sell it. I&apos;m 38 and have moved 27 times. I&apos;m drilling holes. Mopping, vacuuming and dishes will always be there. The best time you can make with children is time. Hang with them. All the other things can wait. 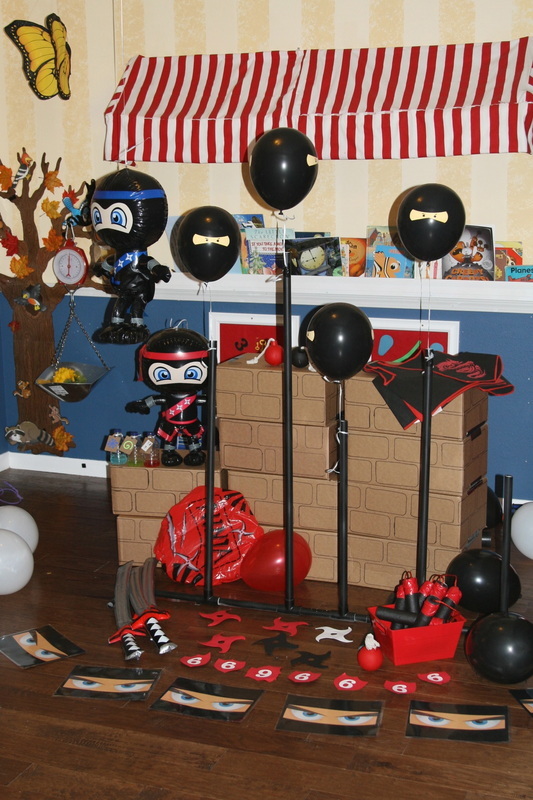 Here is my take on the ninja birthday theme. I found so many great ideas on Pinterest. 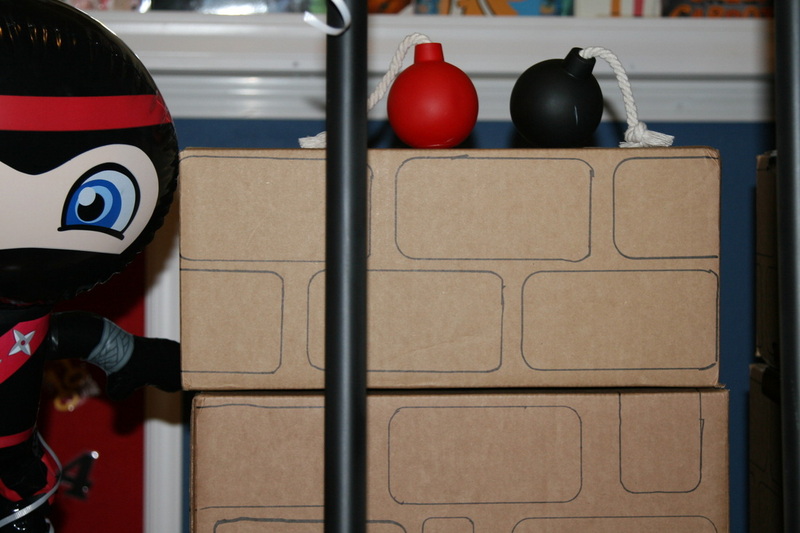 I was also inspired by the Clumbsy Ninja App. My boys love that game. 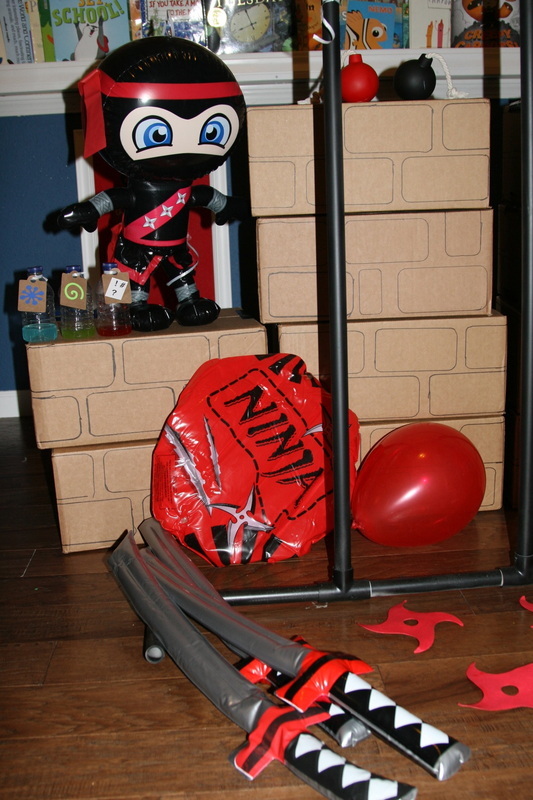 I hung the Ninja blowup doll's from the ceiling. 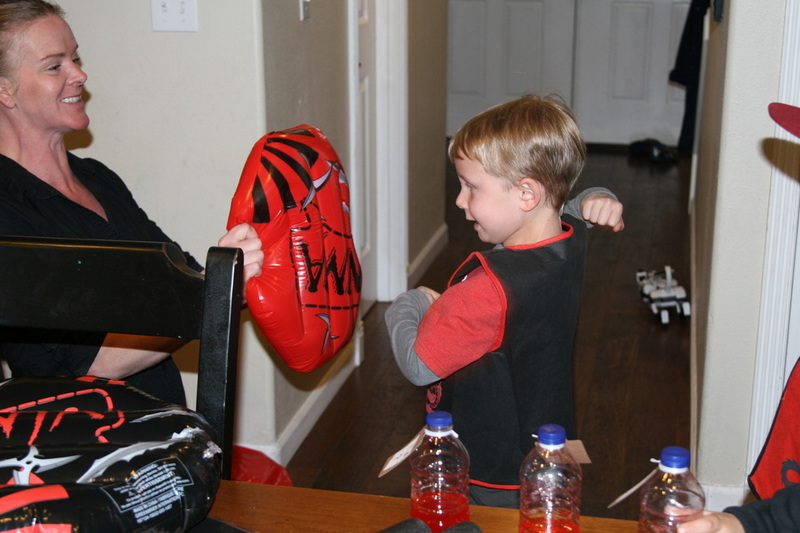 The kids used nom-chucks, swords and many ninja moves to knock them around. I bought the dolls on Amazon. They were $7 for two. 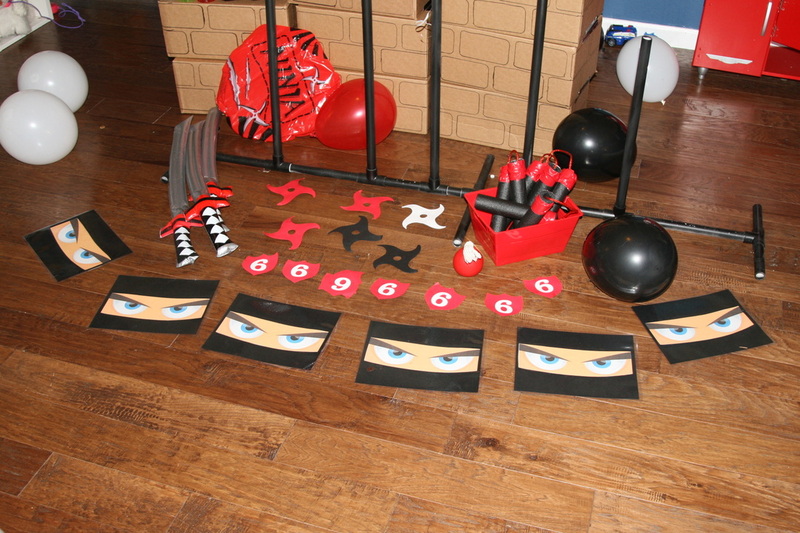 The ninja eyes were our placemats. I printed out one set of eyes and cut the eyes off the black. I didn't want to waste all my printer ink on the black part. Once cut, I copied just the eyes and pasted them to black card stock paper. Then I laminated them. I used the number 6 as a game. 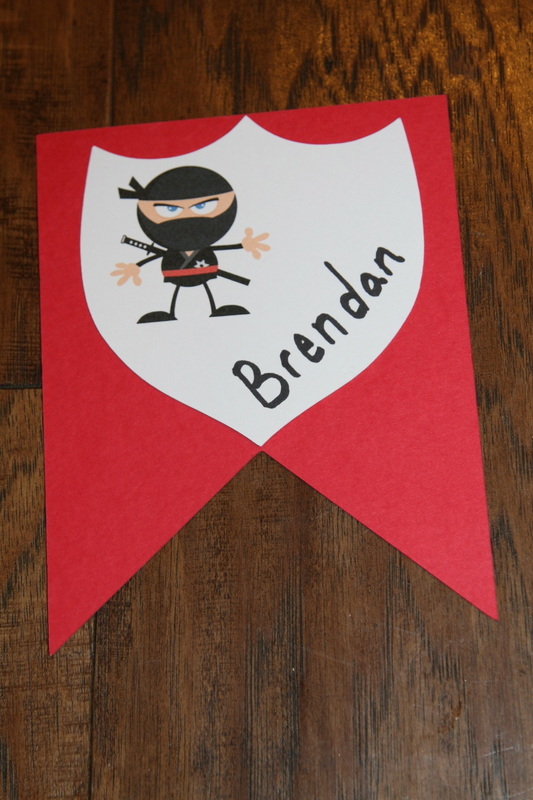 We spread them out throughout the party and had the ninja's hunt them down. 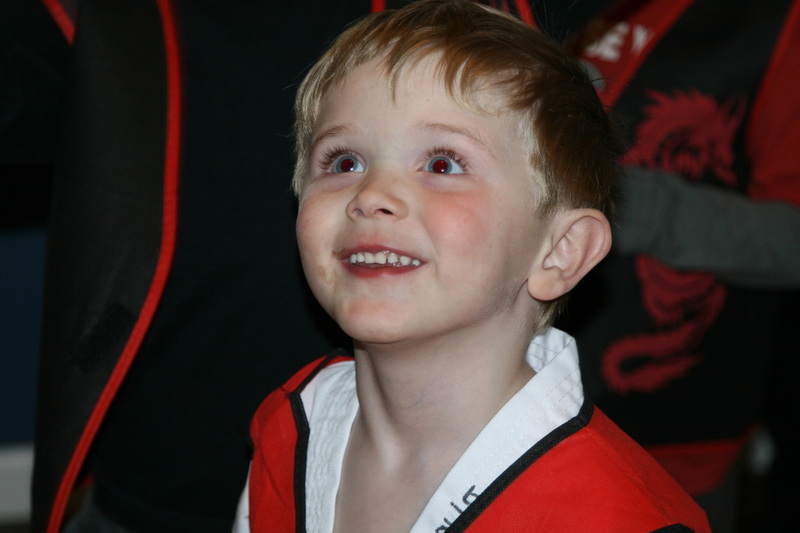 The ninja with the most 6's won a special prize. 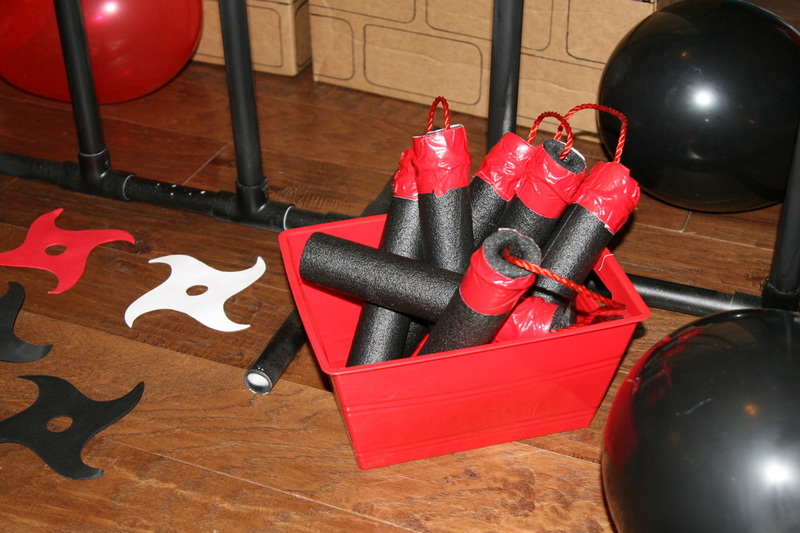 I used foam pipe insulators, red rope and red duck tape to make the nom-chucks. These were used the most of all ninja weapons. I copied an image from the internet to create the ninja stars. I printed out 3 on card stock and glued them together. It gave them more weight and durability when being thrown. 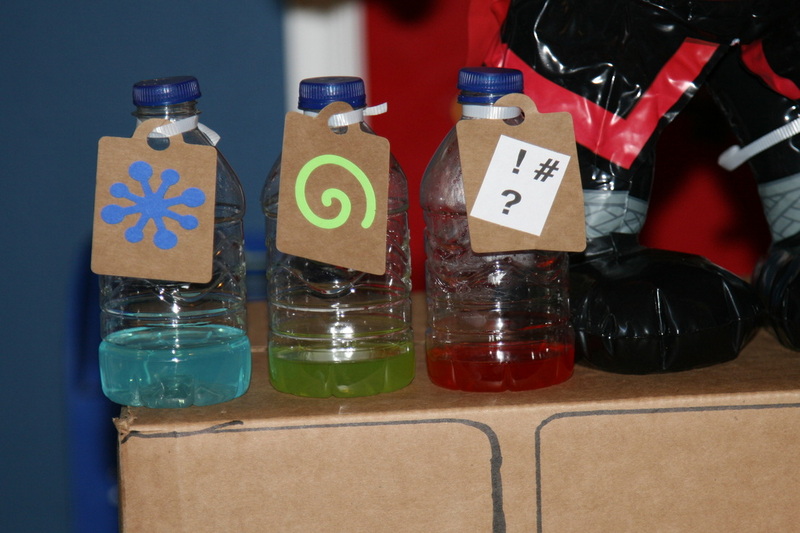 These are the ninja potions. The concept was inspired by the clumsy ninja app. This was the biggest hit of the party. 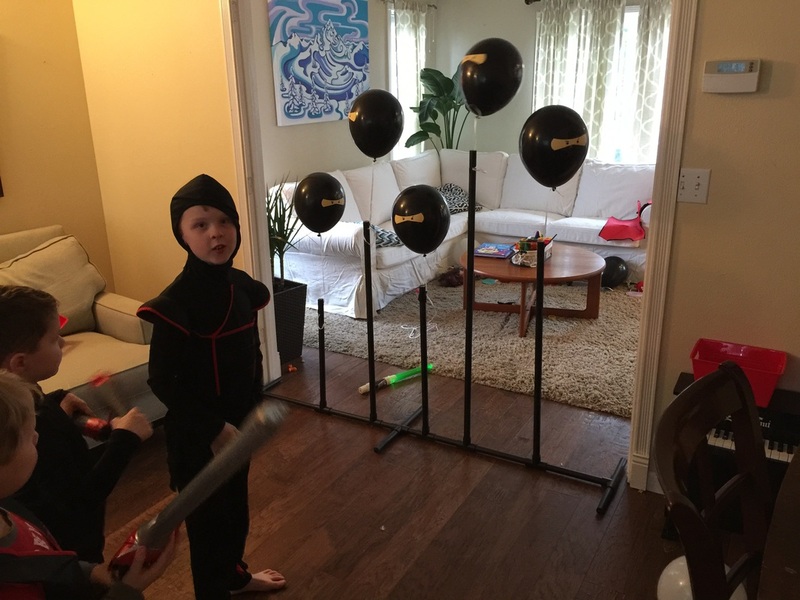 If you are having a ninja party- definitely do this. We had a freeze potion, punching and spinning. 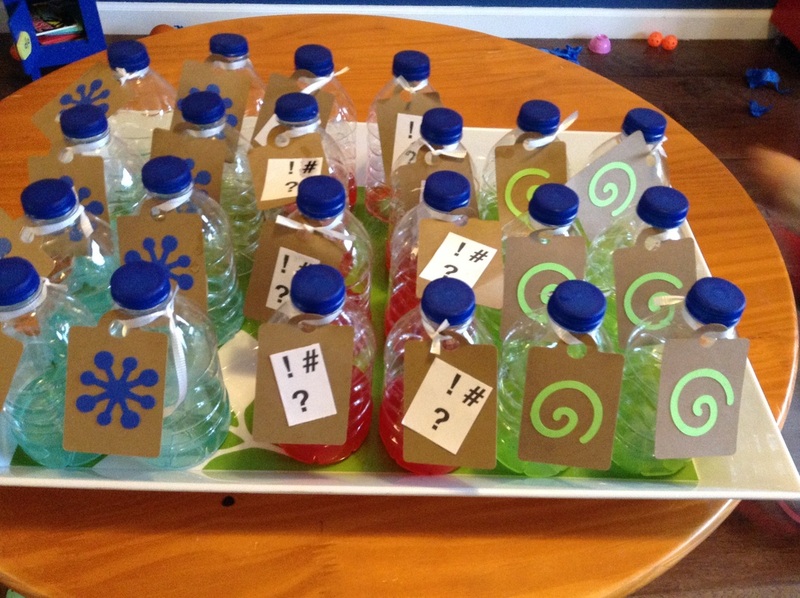 The kids stayed hydrated, acted out funny impressions after drinking and they served as great transitions to each activity I used gatorade, 10oz water bottles and created fun tags with symbols for each. Here the kids drink the punching potion. 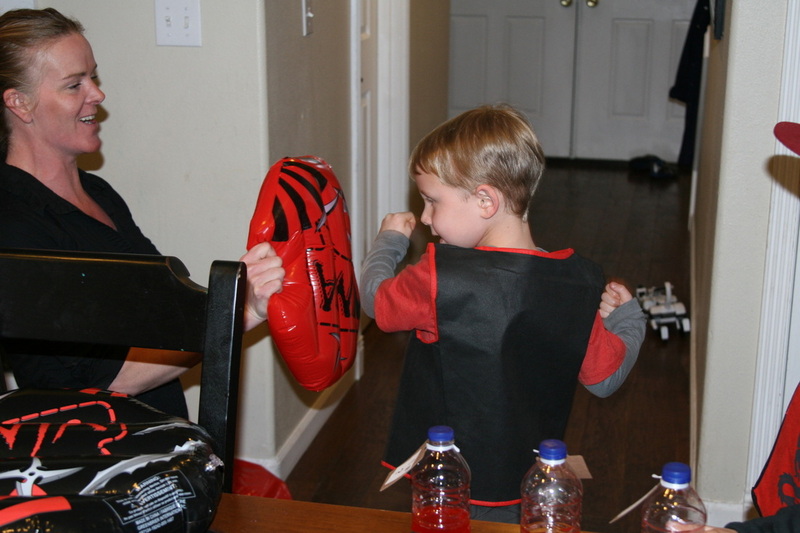 I picked up the inflatable ninja shield at the dollar store. 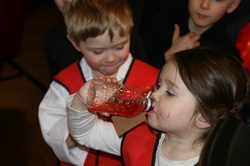 The kids were really into this simple activity. I made a Hi-Ya chopping game out of 3 pieces of wood. I used blue painters tape for them to chop. I tried to use brown masking tape but it didn't work as well. That tape cut down the side and didn't leave a noise when chopped. The painters tape chopped down the middle and left a fun vibrating sound when chopped. I used tape because it was the quickest way to reload the chop for the next kid in line. If you build this, make sure the width of the area is wide enough so the kids don't get hurt. The Brick Wall. This was another great one. Scored 30 of these boxes at a yard sale for $2. At the time I didn't know what i'd use them for but it was too good of a deal to pass up. I used a card stock pattern and traced it with a sharpie to create a brick look. 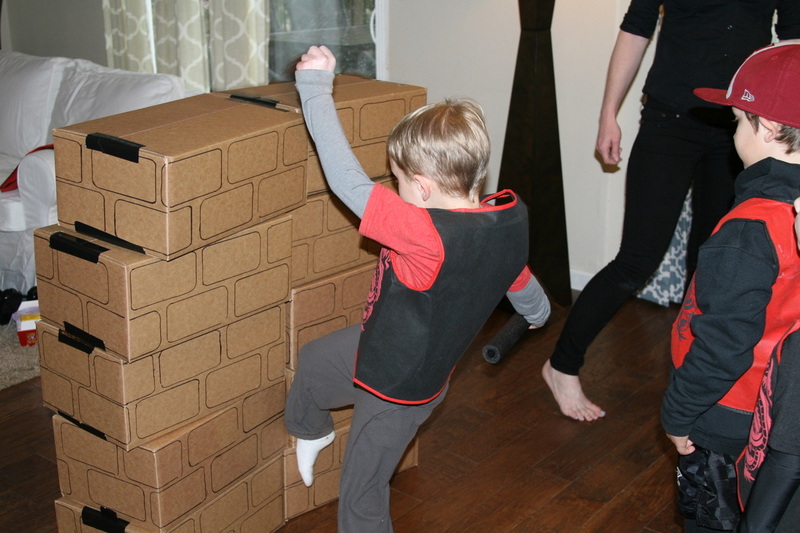 The kids had fun building various towers and then destroying them with their power kicks. Hit the Ninja Game. 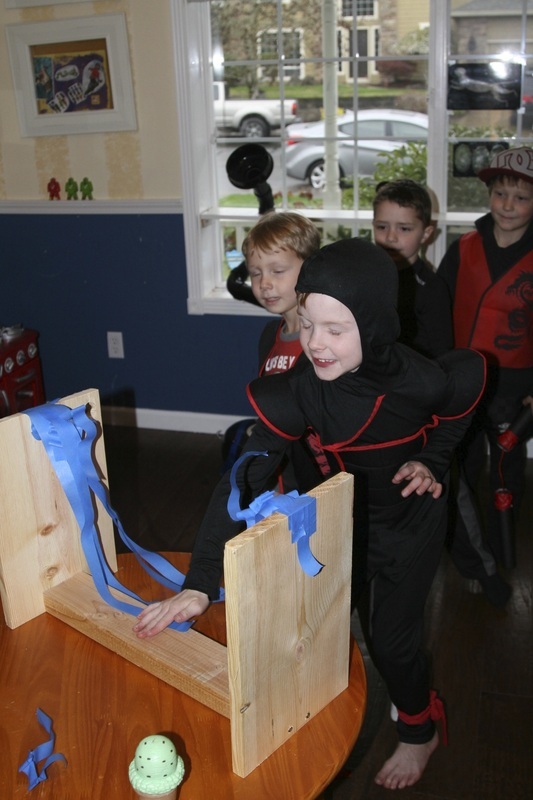 Kids used toy bombs, swords and nom-chucks to knock the ninjas down. Bought the balloons on amazon. 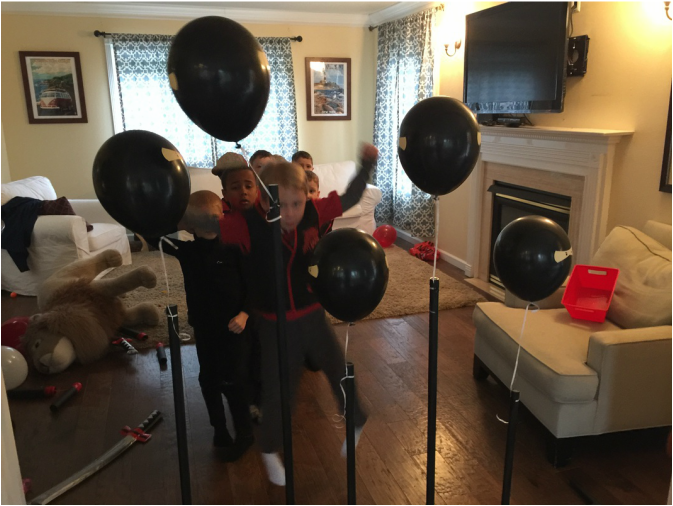 Created this PVC pipe structure to tie the balloons onto. Rubber bombs that squeak. The boms are dog toys found at the dollar store. So easy, lot's of fun. 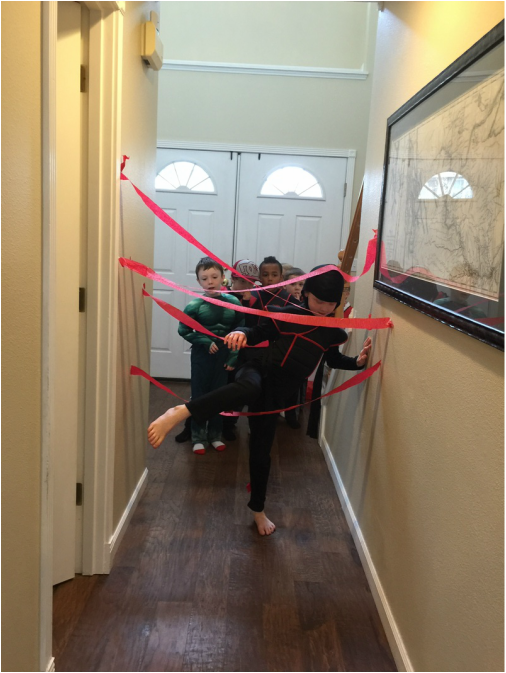 Used streamers to create a ninja obstacle course. It&apos;s all about trying to be comfortable in your own skin. Get that down and everything else will fall into place perfectly. This is a fun theme with lot's of activity potential. 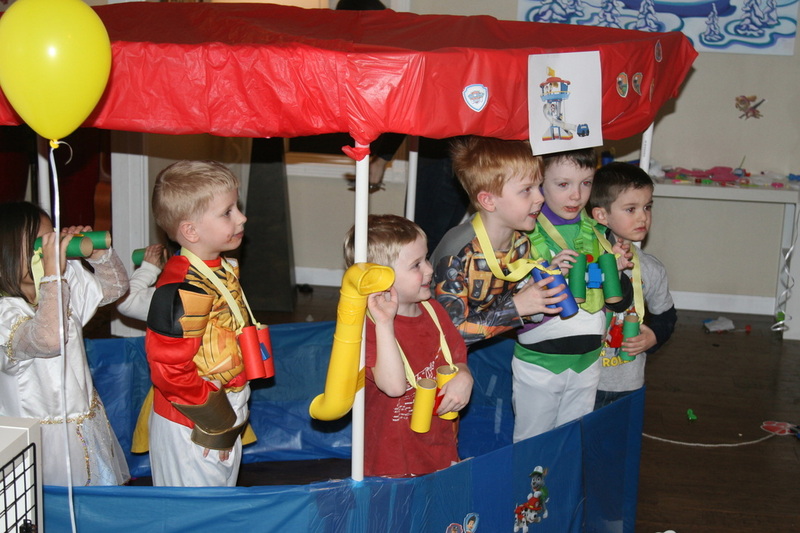 The Paw Patrol team consists of water play, sky catching, construction mining, recycled spy gear, fire dashing and policing. 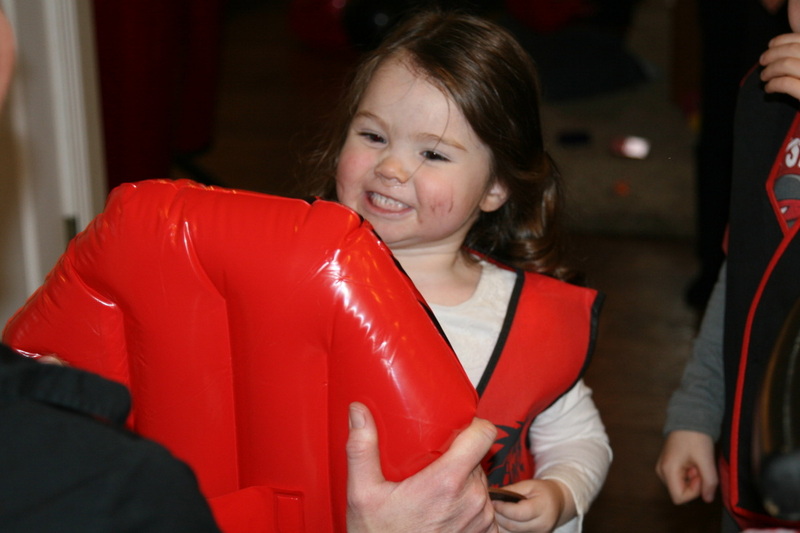 These areas of interest offer great sensory and motor activities for a kids birthday party. It's virtually management free with structured entertainment. I'm setting up fun sensory activities throughout the house based on each dogs interest. Skye is my favorite activity inspiration. All her games will be played using our ceilings. 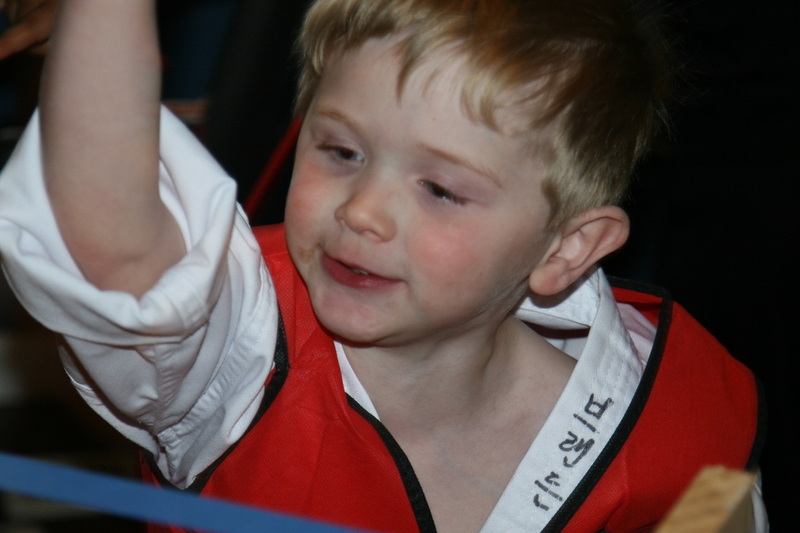 From my Toddler Enrichment Programs, I learned that Ceiling Activities were always a hit with the kids. How often do you use your ceiling? It's such a fun concept. And Festive. I highly recommend using your ceiling more often. 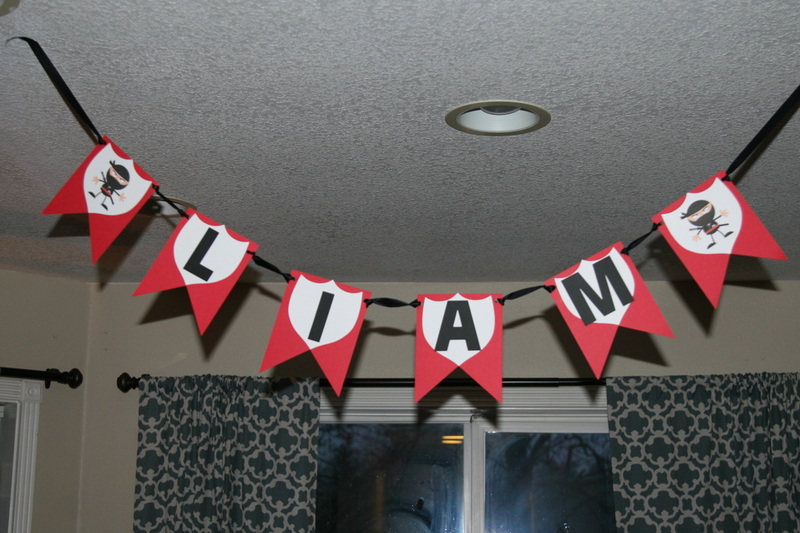 For Brendan's birthday, I'd like to hang all the party favors from the ceiling. The kids will be handed ball zappers when entering. Their ball will be covered with felt. It will be attached to a string long enough to reach the hanging prize. 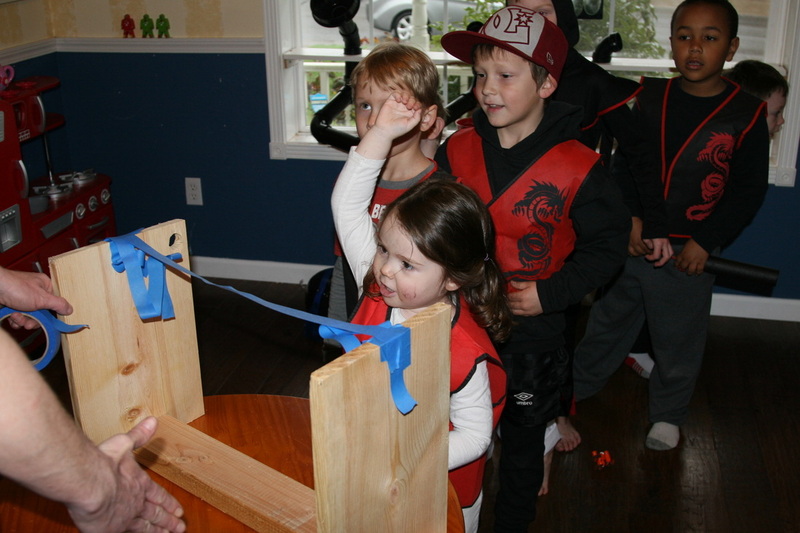 The prizes will be covered with velcro strips so that when the ball is fired it catches the toy. Skye's area will also have velcro bones hanging from the ceiling. The kids will use velcro wands to pull the bones down. 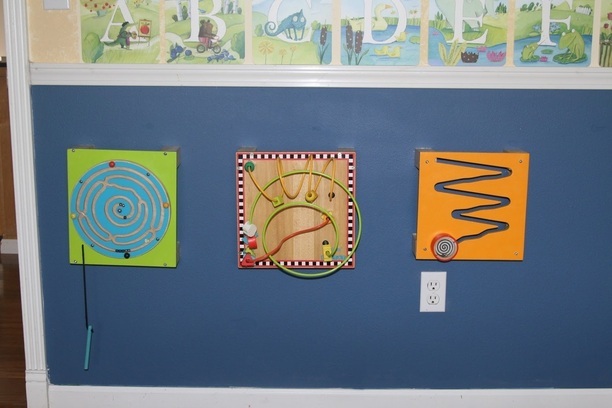 As a side table activity in the pink area, kids will experiment with snap circuit systems that launch propellers into the air. Paper planes and other fun things that fly will be available to inspire sky play. Rubble is my second favorite. He's the construction dog. Inspired by the children's museum exhibit, I'm building a pail pulley system. 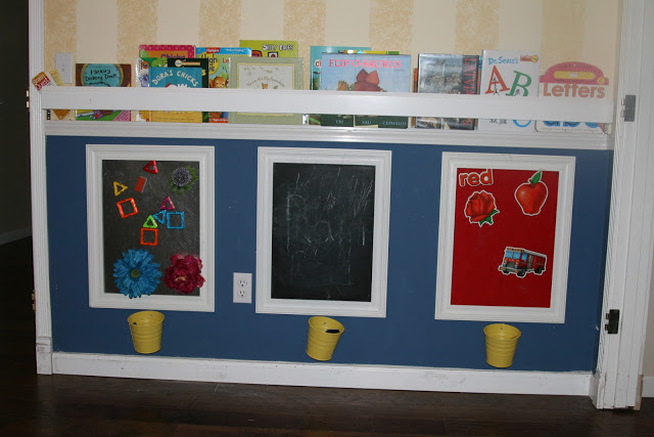 The kids will load buckets of corn feed into pails and shift them from one side of the room to the other. I'll have a few tonka trucks, shovels and sifting gadgets in that area. Rubble's color is yellow so all decor will be yellow. Since I have 700 costumes, i'll lay out our construction helmets too (see Community service for more info on my non-profit community costume closet). 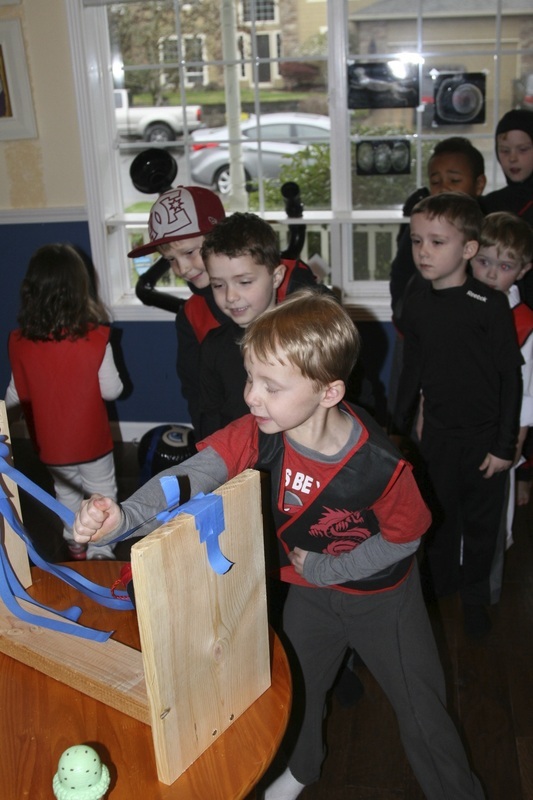 Paw Patrol characters inspire teamwork, problem solvingl skills and community servicing. As a team building activity in Rubbel's construction area, I'm having a carabiner rope race. The teams of two will start in the middle equipped with equal sets of carabiner's and ropes with loops. First team to reach opposite ends of the room, wins a prize. Zuma is all about water. One of my personal sensory favorites. For Bum Bum's birthday, Zuma's station will have orange water and air balloons hanging from the ceiling. Something fun for the kids to punch around. The water table will have boats with balloon power, submarines with baking soda power and plastic boats frozen in large ice blocks. The kids LOVE large ice blocks. I'll have small squirt bottles with warm water at hand for those eager to claim the boat prize. I made this out of cardboard, PVC Pipes and colored Plastic Tablecloth. The construction was very easy (once we figured out how to do it). The top removes from the bottom. 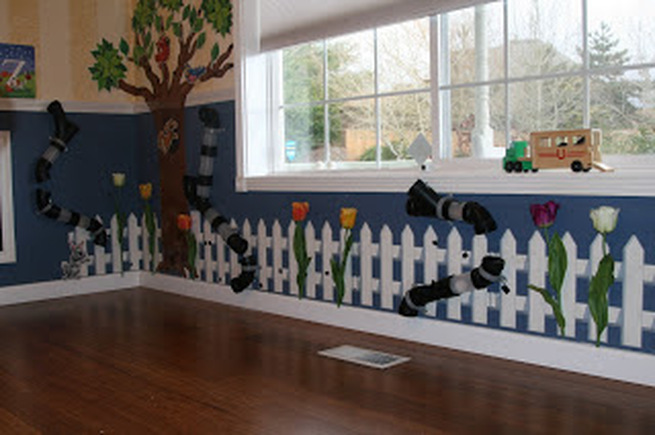 1/2 PVC pipes slip into 1" pipes which are fastened to the cardboard frame. Covering the cardboard was as easy as wrapping a large gift. When I construct my next lookout tower, I'll use fabric. I'll create slip covers for the top and bottom and reuse this structure with multiple themes. Some themes that come to mind are; construction, carnival, lemonade, dog park and ice castle. I'll avoid Trademark images. If you're a stay at home mom who is crafty and can sew, this could become a small local business opportunity where you provide specialized Party supplies. I plan to try this myself. I'll share design and theme ideas along the way. I'll also keep you updated with my marketing strategy and product pricing points. 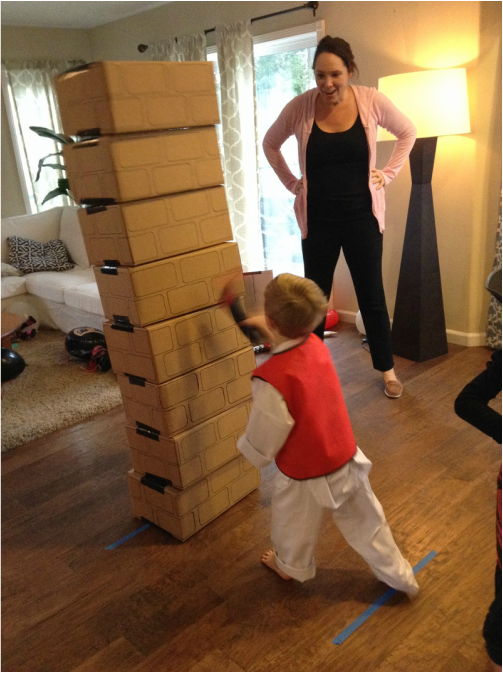 House Cleaner and Baby Sitting Expenses -Think Outside The Box. Instead of hiring a house cleaner, handyman and/ or full time childcare, I decided to just hire a personal assistant. I have to say, this is a very good decision. It's totally motivating my business mind which can easily get put to the side when being a stay at home mom. Having an assistant is forcing me to think of ways to drive additional income and that's a win in my book. Totally onto something big right now. I can feel it in my bones. One day, I'll own some acreage. I'll be the architect and engineer. The inside walls will be designed to act as tunnels throughout the house. All entry points will have a mysterious means of access. Great escape routes. Preparedness yet fun. That would be my house framework for sure. I would also build tunnels below. They would extend beneath my entire property (and beyond , wink). I'm sure I wouldn't have any HOA issues and besides, whose checking for underground tunnels, lol. I suddenly have the urge to learn morse code. It would be a great property. I'm already seeing fun family nights of scavenger hunts and mystery games. All followed by a great bon fire. Having this someday, inspires me to work hard today. I think I'm onto something. Instead of re-upholstering furniture, I'm going to create custom slip covers. There's a tremendous amount of great pieces available on Craigslist alone. Some for as low as $10. Many for free. Re-upholstering is pricey, but a custom slip cover is super easy. You have to know how to eyeball the pattern. You won't be removing the existing fabric which is the most time consuming aspect of re- upholstering. Instead, you'll simply be making a contourned cover to go over it. I default to tailoring and detail by covering existing fabric with a stretch type fabric (white when possible). Staple gun that in. Pin your patterns and adjust with each fitting. Consider a zipper function to provide tension. Create slip cover so that it can be washed and hung dried. I&apos;m trying this so I can raise additional funds to support a larger idea- something I aim to patent. 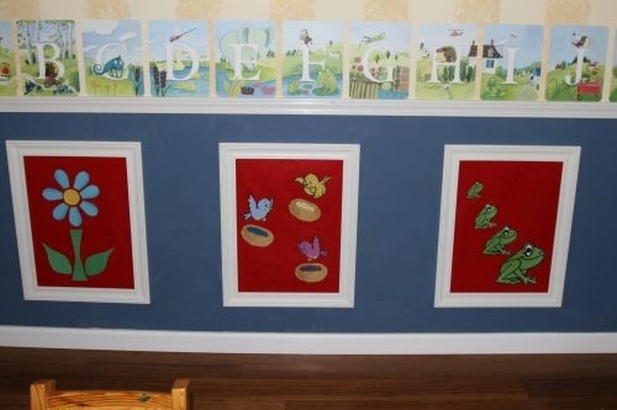 I love re-designing our kids playroom. 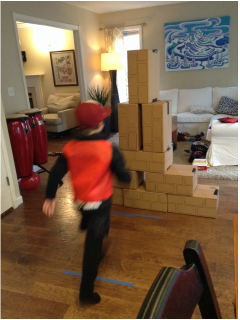 Our once dining room is now the most active room in the house. Initially, I got drill happy. I attached just about everything to the walls. The room looked amazing and the kids loved playing in it. Here are some of the fun things I created for them. I'm learning that the simpler the feature, the more the kids play. 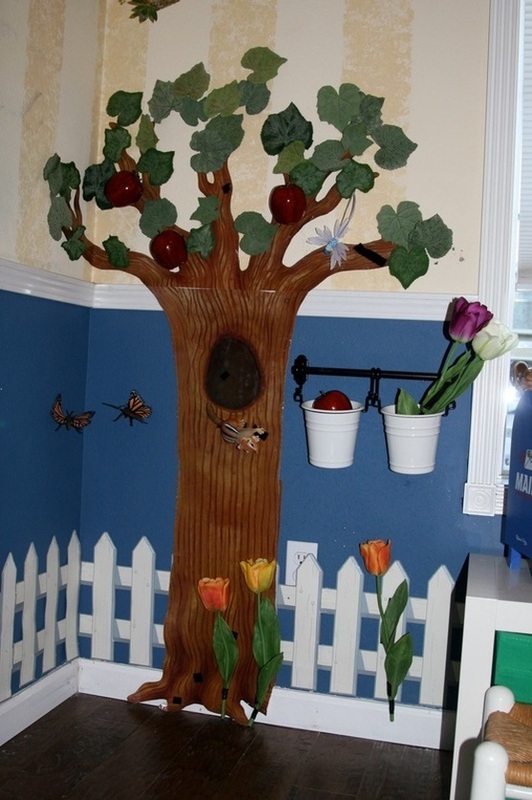 This feature took 15 mins to make and thus far is the most popular in our backyard play scape. I used 3/4 thick PVC pipes, three 90• elbow fittings and one hose to PVC pipe fitting. I drilled holes through the top of the structure, spacing them out about 3" wide. The kids love running through the structure but also love trying to escape the water by going between the streams (the drill spacing). I used PVC cement (glue) to hold the pipes together. Total cost is less than $10!